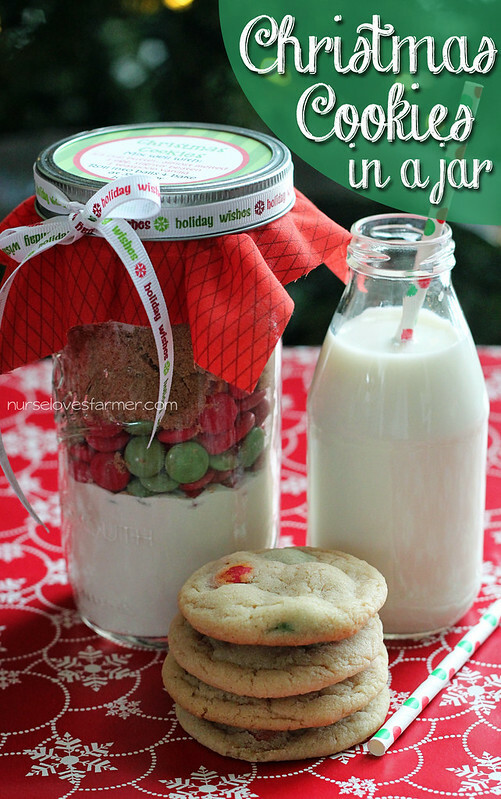 For that someone who has everything, for the un-baker, for the person who loves homemade gifts from the heart, I’ve got a great and easy gift for you to make – Christmas Cookies in a Jar! I am just so thrilled with how these turned out, especially because I am not typically your DIY-type of blogger. I bought the biggest mason jars I could find online, 24 oz from *Greenmunch and this size was PERFECT for this recipe. If you have 32 oz or 1 quart jars you can find, you could probably double the recipe but it might be a tight squeeze. An easy way to pack the ingredients into the jar is to tap the bottom of the jar with the heel of your hand, but for the jars and recipe I used, no packing was needed. One tip I would tell the recipients of this lovely gift is that when you mix the dry ingredients into the wet ingredients, you can use a wooden spoon or spatula at first, but then just get right in there with your hands to incorporate it better! You need to roll these into balls with your hands anyway, so just get right on in there. 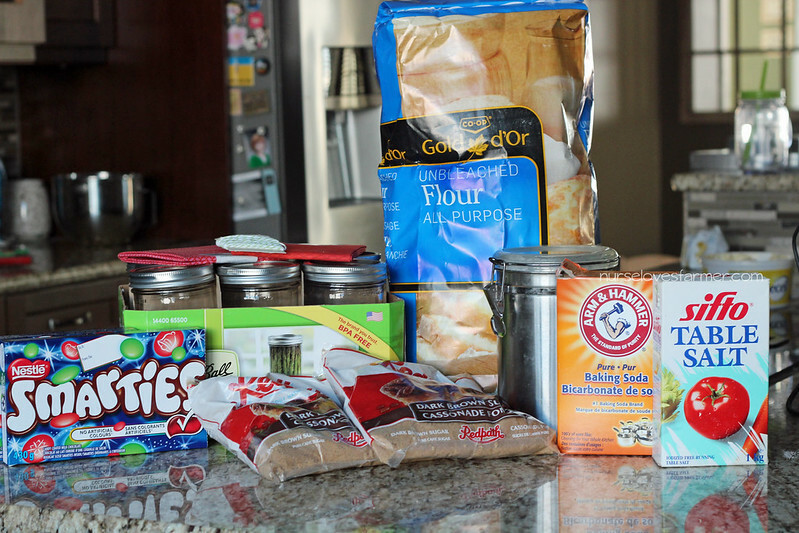 It might seem like they won’t mix or hold, but keep mixing – I promise they will! Pack ingredients in order above into jar. Add Christmas fabric, if desired on top of jar lid. Add label on top & screw on lid. Decorate with ribbon or baker's twine if desired. Beat butter, egg, and vanilla until well mixed in medium mixing bowl. 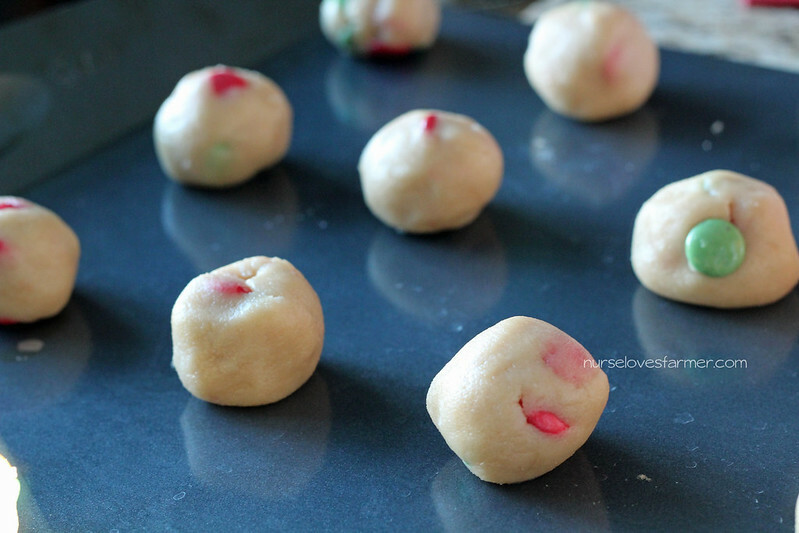 Roll into balls, place on baking sheets, bake at 350 for 10 minutes. If you have Christmas fabrics at home – great! I don’t have much option where I live (or a stash to pick through) so I just bought little fabric palettes from Walmart for $2.47 each that are 18″x21″. I found that a 6.5″x6.5″ piece of fabric was right for me, so I cut a bunch of squares, secured them over the Mason jar lid with the screw lid and then cut my labels (see below!) and screwed on the top! 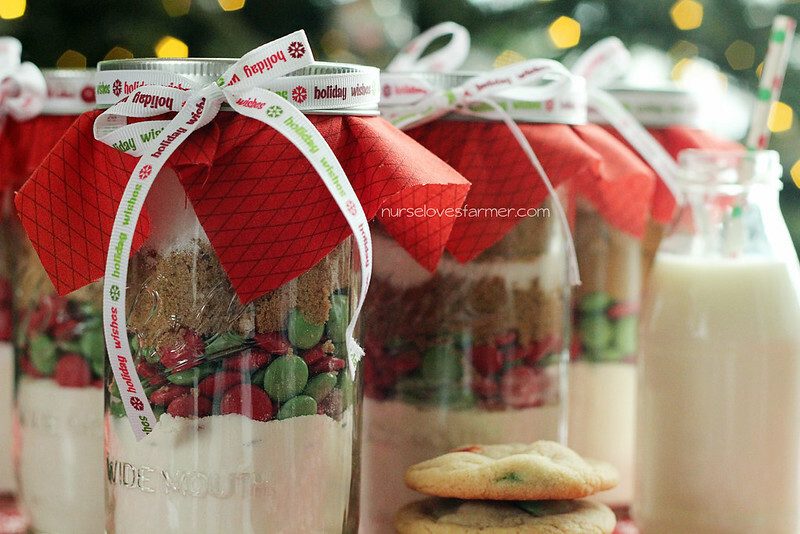 Alternately you can attach the labels with baker’s twine or ribbon and tie it around the lid of the jar. I found these free printables here and here and then just added my recipe in Photoshop Elements using my favorite free font site for some new Christmas fonts! If you don’t have an editing program there’s lots of free ones around, or go old fashioned and use your handwriting! 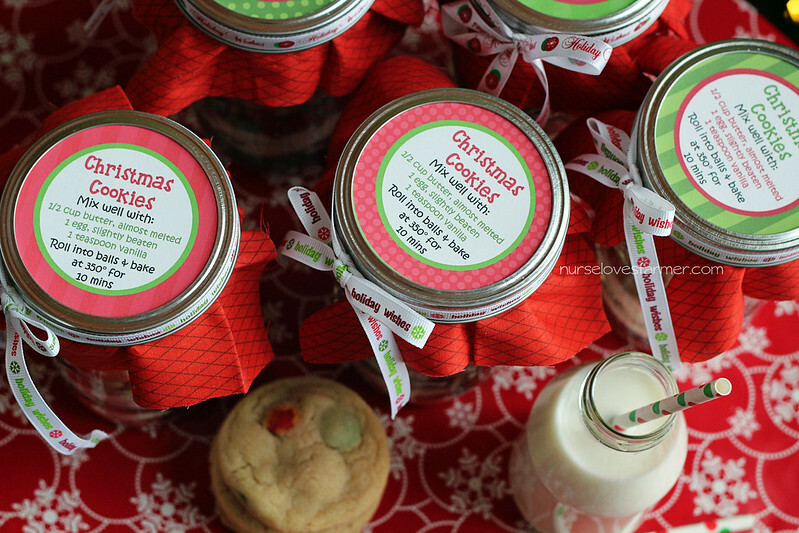 Please feel free to download and print my Christmas Cookies in a Jar Labels, but they are for personal use only, not commercial. You should be able to click on this image to get the original size, right click and save it. Aren’t they pretty!? I am giving myself a pat on the back AND tooting my horn – this is way out of my comfort zone, but I had a lot of fun doing it and I’m already looking at more homemade gifts I can make in mason jars! Then of course, you pour yourself a cold glass of milk, decorative paper straw optional, and enjoy! Thanks for the great cookie recipe Sarah! I have a bunch of tall 20-24 ounce mason jars and thought they would look wonderful with mixes in them for gifts, but had a hard time finding a recipe for that size jar. If you have more recipes for unusual size mason jars I would love to see them! Thank you so much for the adorable labels! 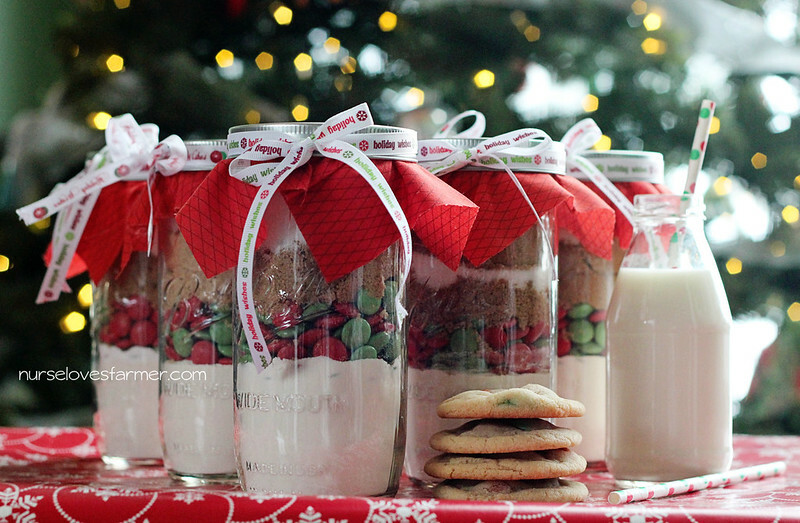 I was stressing about how I was going to create labels with the right ingredients to add to my mason jar cookie gifts, and I did a quick google search, and lo and behold . . . there they were! Easy button! Love it when that happens! Thanks for the feedback! Below is a cut and paste quote from your article, so now I am confused. "I bought the biggest mason jars I could find online, 24 oz from *Greenmunch and this size was PERFECT for this recipe." Just trying to find out "about" how many jars the recipe filled. I have the same size jars you said you used. Not asking for you to do any math. I could figure that out, but thought it'd be easier to ask you about your experience since you stated you used 24 oz jars in the write up. Now I'm wondering what size jars you did use? I apologize, Heather, each recipe is for 1 jar, so you can fill as many as you'd like. That's why I was confused. Does that make sense? How many 24oz jars will this recipe fill? Looking to use my jars for a class fundraiser and am struggling with how much flour etc. to purchase. Thanks for the recipe and post! Edit: Please read above: 1 recipe is for 1 24 oz jar. This is such an adorable idea! I love all of the printables too. Thanks for a great idea. I love this! Just like Heather said, great for teacher gifts! Thanks so much, Censie. This post took a lot out of me, but I'm so happy with it! Well done! They look awesome!! Thank you! Aren't you impressed with my crafty self? This is a great post, you did a great job with these gifts Sarah! Love the idea 🙂 I may use this for teacher gifts this year! Ps. Love the little glass milk bottle – I wonder where I can get one of those. thank you, Heather. This is one of the hardest posts I've ever worked on – took a lot of creativity for the non-DIYer that I am! 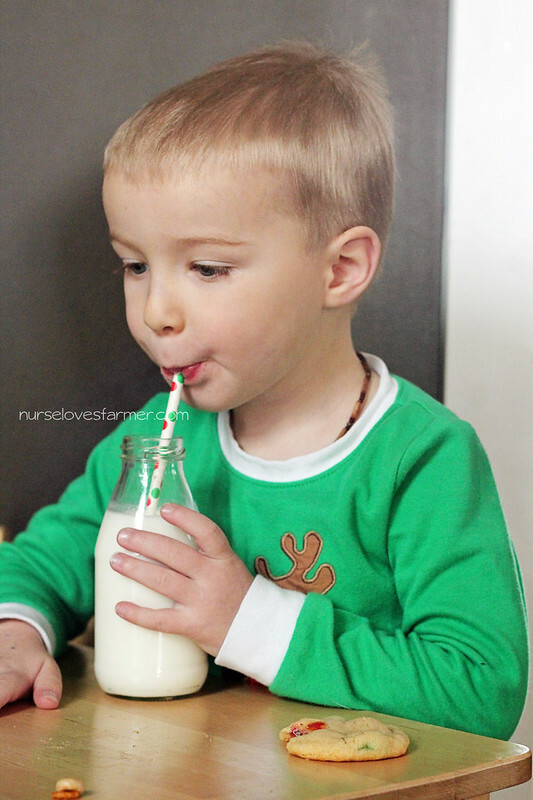 As for the milk bottle I got mine from Greenmunch.ca and they do ship to US!